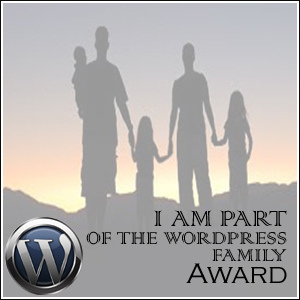 The lovely and totally brilliant Life Confusions very kindly nominated me for the WordPress Family Award last week. Thank you so much, I am very honoured. It took me quite a long time to pluck up the courage to start my own blog. Some of the questions going through my mind were: Will anyone want to read it? What if they think I’m rubbish? And how will I deal with any nasty comments? Well, my blog is still tiny but a few people seem to enjoy reading it which makes me very happy. What has really floored me though (in a good way) is the warmth and friendship that flow through this whole blogosphere. Most of my blog friends I will probably never meet in real life (mainly due to the distance between us) but it’s comforting to know that there are so many lovely souls out there. And if I do ever travel to any of the places where you live, rest assured that I will let you know. Congratulations and thanks soo much for the nomination! I’ve only been blogging for a little over a month and everyone has been so supportive. I truly appreciate it! I would like to ask your opinion on something personal. Here is my email: webcamshrink@gmail.com (I don’t know yours) could you throw me a line please.